Today, I'm taking a behind the scenes look at the tornado scene in The Wizard of Oz (1939). This article is part of the Nature's Fury Blogathon hosted by Cinematic Catharsis. While the Gulf Coast has its hurricanes and California has its earthquakes, tornadoes are the Midwest's example of nature's fury. MGM's beloved classic The Wizard of Oz (1939) brought this mostly North American weather phenomenon to a prominent place in pop culture thanks to one of the most impressive special effects scenes in old Hollywood history. The tornado that deposits Kansas farm girl Dorothy Gale into the magical land of Oz was first brought to life by L. Frank Baum, author of the 1900 children's novel The Wonderful Wizard of Oz. Baum, who was something of a jack of all trades, worked for a time as a newspaper reporter in South Dakota where, in 1879, he covered two large tornadoes that destroyed the town of Irving, Kan.
Baum began weaving the natural disaster into stories about a magical land that he told his children, and a devastating cyclone, as Baum called it, begins the first chapter of The Wonderful Wizard of Oz. (According to the good people at The Weather Channel, Baum used the wrong terminology: a cyclone is a tropical depression or storm, something that obviously doesn't occur on the Great Plains. The film uses either cyclone or twister, which comes out as "twist-uh" in Bert Lahr's thick New York accent). When it came time to make the movie, the task of creating the tornado fell to MGM special effects director A. Arnold "Buddy Gillespie. Gillespie began working at the studio during the filming of the silent version of Ben-Hur, and he was a veteran of natural disaster sequences, mostly notably in recreating the 1906 earthquake in San Francisco (1936). At first, Gilliespie tried a large rubber tube, but it was inflexible and didn't give Gillespie the undulating movements that he wanted to appear onscreen. After more trial and error, Gillespie got an idea from the wind socks that meteorologists use to monitor weather conditions. He created a 35 feet muslin tube that he suspended above The Wizard of Oz sound stage on a large steel gantry crane. The bottom of the tube went below the stage floor where a team of grips drove it up and down with a vehicle. Gillespie then had air compressors blow a fine dust called Fuller's earth, which created a cloud of detritus around the tube. The clip below shows Gillespie's tests for the tornado sequences. Gillespie and his team received an Academy Award nomination for their groundbreaking special effects (they lost to The Rains Came), and MGM re-used the tornado footage in other films, most notably in the 1943 musical Cabin in the Sky that was coincidentally the Hollywood debut of director Vincente Minnelli who would later marry Oz star Judy Garland (the clip from Cabin in the Sky is below). 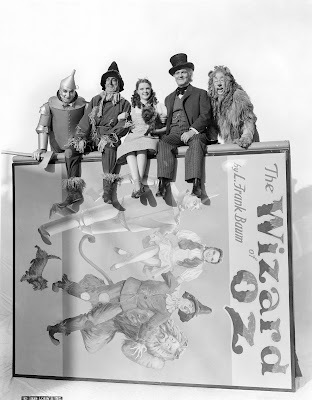 The Wizard of Oz became a television staple during the 1950's and 1960's, and the terrifying twister, along with many other things from Oz, became embedded in America's pop culture consciousness. The 1990's saw a renewed interest in tornadoes that culminated in the movie Twister (1996), which provided a massive computer-generated storm that had everything but the Wicked Witch of the West flying by. The Wizard of Oz is available on DVD, Blu ray, and video on demand. Fascinating and informative! I live in Nebraska, and the tornado scene is what scared me as a kid, and still makes me tense. Thanks! I live in Ohio and the tornado scene still scares me. Never would have thought of covering special effects in this blogathon. Rather interesting. Never have seen a tornado first hand, but I have seen the after effects of some. And I was just in front of, apparently, the one that devastated Moore, OK a couple of years ago. I had a hotel room in south OKC that night. Nice article, Amanda! This scene still manages to impress today. I'm really happy that someone chose to write about it. 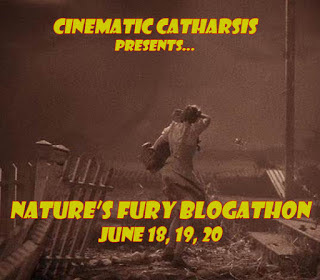 Thanks for participating in the Nature's Fury Blogathon! The tornado from The Wizard of Oz is a brilliant choice for the blogathon. I never would have thought of it. That movie never gets old no matter how many times you watch it. There's a tiny error in this, "Oz" lost the Oscar for best visual effects to "The Rains Came", not "Gone with the Wind". Thanks. I was relying on my (obviously faulty) memory.